“Hand me your shoes.” The quiet, no-nonsense guide requested with his hands out towards me, gesturing to my sandalled feet. We were standing on the shore, the waves lapping at our feet, the canopied boat waiting to go, while I stared at our guide blankly, as if he had just asked me to hand over my wallet. I’m not usually a shoe freak, but I was wearing my favourite leather sandals: sandals I love so much, that I’ve replaced them with the exact same pair three times over the last fifteen years as they’ve worn out. Not only did I not want to lose them, but I didn’t want to find myself having to walk across the Stone Town sand barefoot, covered in broken glass, plastic bags and decaying fish heads. The guide gestured to me again. “Shoes!” he prompted. Ok, if we were doing this thing, I had to relinquish my sandals. I slid them off slowly and handed them over. Mark and I waded into the ocean toward the boat, and climbed in. I was slightly surprised when our guide appeared in the back of the boat, shoes still in hand. Ok, it’s good to be cautious, but sometimes you have to trust people too. Leaving Stone Town behind for a day trip! Although it was early morning, the sun was already beating down, so we were grateful for the bright blue canopy overhead. We started off, just Mark and I alone on the boat, except for our guide and the captain. 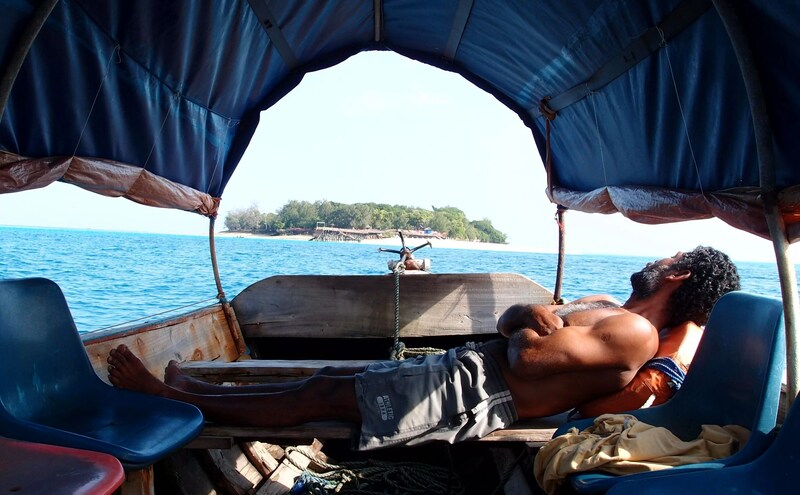 When even the captain is this relaxed, you know you’re in for a good day. I have to say that the colour of the water in Zanzibar is spectacular. It’s like a transparent aquamarine that I still dream about years later, and photos fail to capture its full beauty. It took about a half an hour to arrive at the island, where our guide assisted us off, and handed us our shoes. As the captain waved goodbye and began to sail off, our guide started yelling at him in Swahili, more and more frantically, waving his hands and jumping up and down. But to no avail, the captain either didn’t hear him, or chose to ignore him. Apparently he forgot to give us our tickets to enter the tortoise sanctuary. Our guide told us not to worry though, he had the situation under control. (It’s probably happened before.) As it is, entry to the sanctuary is only about $6 US. There were easily thousands of starfish of different colour combinations and sizes surrounding the island, so many that you should see their outlines through the crystal clear water. We gave them a gentle touch before our guide settled them back down into the water. See all of those dark shadows in the water? They’re all starfish! So how did Prison Island get it’s unusual name? It actually has several names. Changuu Island is the official name, but it’s also known as Quarantine Island and Kibandiko Island; although Prison Island is probably the most commonly used. Initially, the first sultan of Zanzibar gave the uninhabited island to two Arabs for use as a prison to house rebellious slaves in the 1860s. After Zanzibar became a British protectorate in 1890, the island was purchased from the Arabs with the intention of building a prison to house violent criminals. The buildings were completed in 1894, but they were never actually used as a prison. Instead, diseases such as Yellow Fever and Cholera became the more pressing threats to East Africa. So the island buildings, including what was intended as a prison, were converted to a hospital and quarantine station. Although the old prison/hospital is still standing, it has since been converted, for the most part, to more practical uses. If you happen to use the women’s bathroom, for example, be sure to take note of the metal rings imbedded in the floor. No doubt meant to chain prisoners when the building had a more somber purpose. In between outbreaks, the island became a popular resort for Zanzibar locals and Europeans. Old coral mining pits were cleaned out and converted into swimming pools. The newer quarantine station became a guesthouse, and has since been remodelled into a hotel. 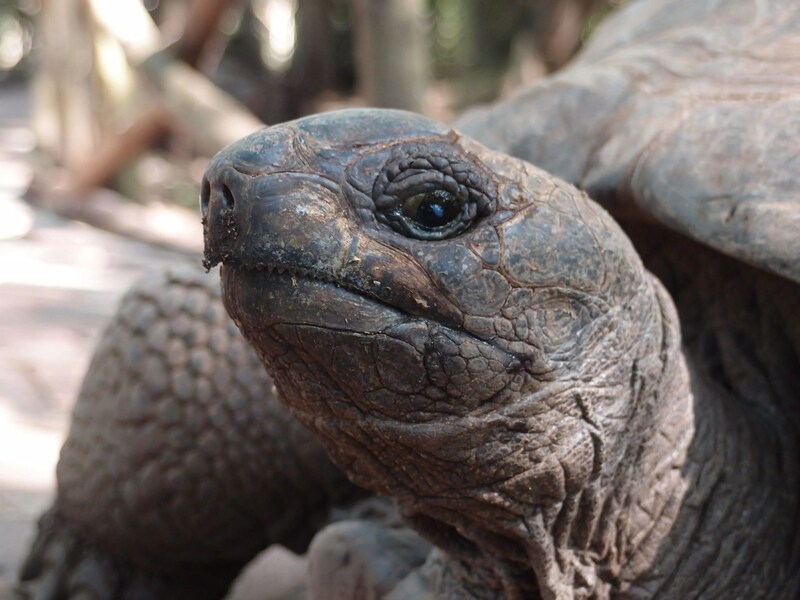 In 1919, the British governor of the Seychelles gifted the island with four Aldabra giant tortoises. In exchange, Zanzibar sent native flowering plants to the Seychelles. Over the years, the tortoise numbers swelled to about 200. But due to poaching and being sold as pets, their numbers dwindled to as few as seven. They are now listed as a vulnerable species, and the Tortoise Foundation on the island is dedicated to their protection. 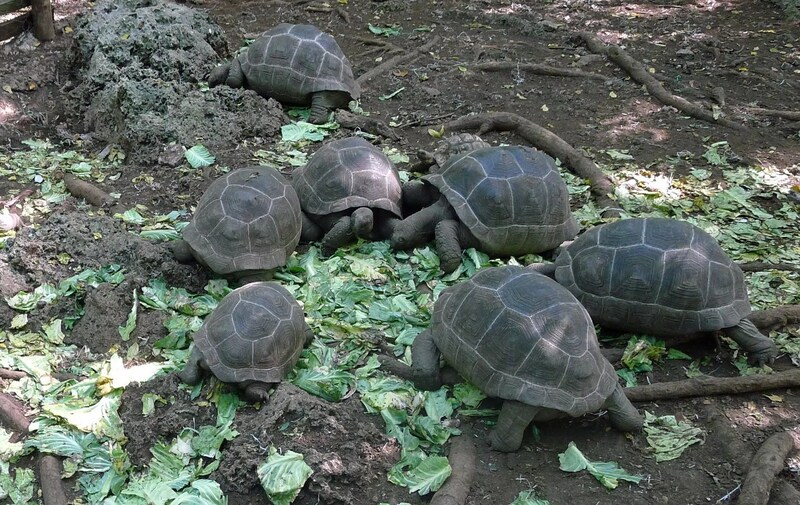 There are now over 100 Aldabra tortoises on Changuu Island. As soon as we entered the tortoise sanctuary, we were blown away by the number of tortoises, as well as the size of many of them. The Aldabra tortoise is one of the largest tortoises in the world! (Only the Galapagos species is larger). The Aldabra tortoise can weigh as much as 550 lbs, and its carapace (the hard upper shell) averages 48 inches in length. They can extend their necks to reach low-hanging tree branches. They’re primarily herbivores, subsisting on grasses, leaves and plant stems. But they will also eat carrion or small invertebrates occasionally. Aren’t they gorgeous? And look at those little razor-sharp teeth! Some of the tortoises at the sanctuary had numbers drawn on their shells, but we weren’t sure whether this was to keep track of their ages, or just a numbering system to survey their population. It was just a really peaceful, lovely place to stroll through, and a nice break from the hustle and bustle of Stone Town. As an aside, the snorkelling is supposed to be fantastic here. You can pre-book this at your hotel in Stone Town if you feel so inclined. As for food and drink options, there was a bar and a restaurant that we walked by, but since we came early in the morning after breakfast we didn’t get the munchies. Unless you plan on spending the day lying on the beach or snorkelling, you probably won’t need to grab food on the island anyway. If you get here early in the morning, not only will you avoid the crowds (we were the only two people in the sanctuary for at least a half hour), but you’ll probably be back in Stone Town for lunch. Once you’re done with the tortoises, the rest of the sights go by pretty fast. Allow about an hour to get there and back by boat, and about 2-3 hours on the island. 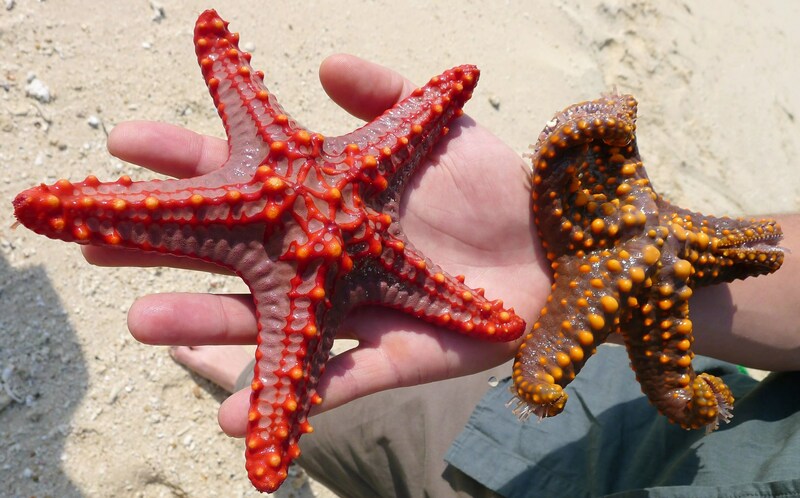 This entry was posted in Zanzibar and tagged Changuu Island, Prison Island, starfish, Tanzania, Tortoises by Darlene. Bookmark the permalink.